Cairo’s big city buzz complements the austerity of its pyramids and sand-covered tombs that mark it as the oldest civilisation in the world. A fast paced city, it holds together a 20 million-strong population, honking traffic, squawking street sellers, blankets of smog, and a general frenzy of activity. It is a city in transition that has all the sorts of quirks and hassles that make it so captivating. 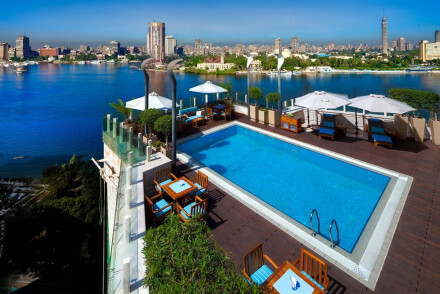 The best places to stay in Cairo are a few boutique hotels and the obvious Five Star luxury destinations. Cairo is a bit East meets West. Islamic Cairo and Coptic Cairo form a rhizome of minarets - medieval schools, mosques, monasteries and ancient churches of the native Egyptian Christians. Wander through the streets to soak it all up and then visit the Egyptian Museum which houses the glittering artefacts of this melting pot. To the West of the city lie the ancient pyramids of Giza, one of the Seven Ancient Wonders of the World and a must visit. Thirty kilometres to the south of the city, the Pyramids at Zosser are well worth a look. Less touristy than Giza and not far from Memphis, Egypt’s under-visited ancient capital. For shopping Cairo offers a wealth of spice markets (Abdal – Rahman Harraz), antique bazaars (Souq al – Gomaa), papyrus makers and bookbinders (Said Delta and Amd El Zaher), funky jewellery (Sami Amin), Egyptian cotton (Moumaya), and silk kaftans (Atlas). The real charms of the city are the stolen moments of calm spent drinking tea with a shop owner, reading a book in a small oasis of quiet, perhaps the leafy garden of your hotel, or marvelling at the frenzy of the day after a delicious seafood supper (try Samakmak). Cairo is a safe city to travel around, though since the revolution in 2011, it’s best to check the Foreign and Commonwealth Office website for travel advice. Taxi or metro are the easiest forms of transport or take a felucca down the Nile, scenic and efficient! At least four days in Cairo is a must in order to really get a sense of the city. It is intense, take it slowly so as to not burn out in the first two days of arrival. 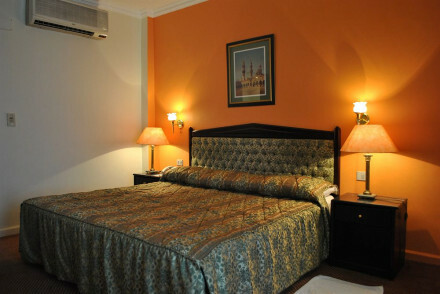 Gawharet Al Ahram Hotel in Cairo – simple rooms with charming balconies very close to the Giza pyramids. Talisman Hotel - full of character and charm. This hotel is great for those looking for an excellent low-cost option. Le Riad – brightly coloured rooms, rich fabrics, Egyptian artwork, excellent roof terrace for laid back cocktails in the evening. Villa Belle Epoque – a charming country house. 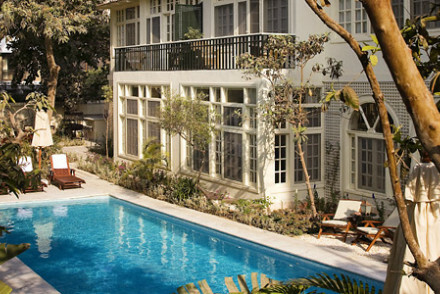 Colonial-style verandahs, romantic bedrooms, large garden with pool, traditional cuisine. Four Seasons First Residence Cairo - a grand hotel with glamourous flair. 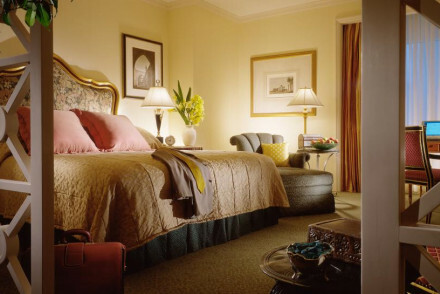 Opulent rooms and suites, views over the river, excellent Thai, Lebanese, and Italian restaurants. 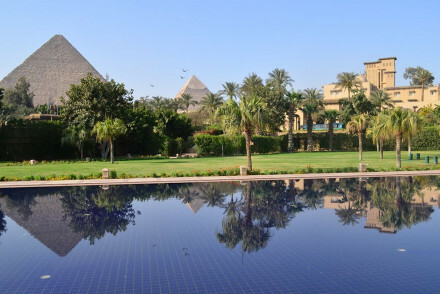 The Mena House Hotel - boutique luxury on a grand scale, close to the Pyramids in Giza. Romantic bedrooms, stunning gardens, excellent Italian restaurant. The Gabriel - a good choice for movers and shakers for its lively roof top bar and fine dining restaurant 'Salt'. The rooms are more glitzy glamour than stylish. 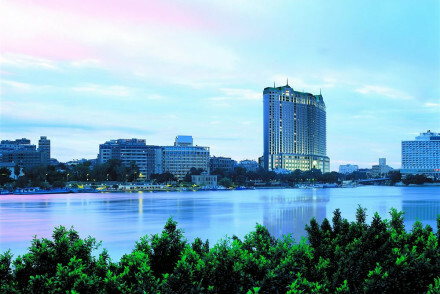 Kempinski Nile Hotel - combining an unparalleled location on the Nile with stunning five-star luxury. This hotel embodies Egyptian grandeur. Four Seasons at Nile Plaza - a vision of modern luxury right on the Nile, from the superb restaurants to a deluxe spa, no expense is spared at this hotel. Looking for a bit of additional privacy, explore the range of private apartments at our online partner Booking.com. International flights for Cairo all connect to Cairo International Airport. For those looking to hire a car, we recommend visiting our online partners Rentalcars. The best times to visit Cairo are in the months that bookend the summer. March to April and October to November are the months with warm temperatures, fewer crowds and cheaper hotel rates. Also you can extend your search and check out all our Egypt recommendations. A cute hotel with simple rooms close to the Giza pyramids. Charming balconies and terraces, a good traditional restaurant and roof top pool. Excellent value, ideally suited to those on a budget. Sights nearby - Close to the Pyramids in Giza, Cairo University, Giza Zoo, and First Mall Cairo. A lovely little boutique with bargain prices. Colourful simple rooms have lots of space and characterful decoration. Walking distance to excellent restaurants. Perfect for visiting Cairo on a shoe string without staying in a hostel. Sailing - Cruise the Nile on a felucca. Sights nearby - Pyramids at Giza and Zosser. A romantic Five Star hotel close to the Pyramids. 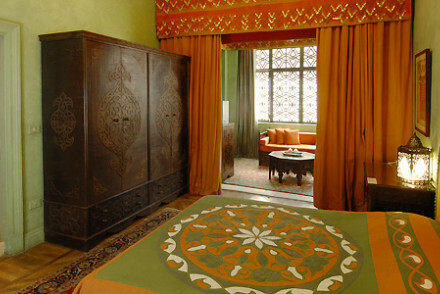 Elegant traditional suites have four poster beds, killim rugs, and Egyptian antiques. Excellent Italian, Indian and traditional restaurants. A top of the range spa, enormous pool, and stunning grounds. A grade. Foodies - Italian, Indian and traditional restaurants. Views - Spot the pyramids! A glitzy luxury hotel in the West of the city. Contemporary rooms and suites have chrome and red colour schemes and all the mod cons. Salt restaurant serves award-winning fusion cuisine. A lively bar and rooftop terrace. A great choice for young and energetic foodies. Foodies - Fusion Mediterranean and Asian. Lively - Bar and live music nights. Sights nearby - City Stars, Virgin Mary's Tree and Cairo International Stadium. A hotel in an unrivalled location on the river's edge. Five Star luxury includes a state of the art spa, a wonderful Italian restaurant, chocolaterie, and a lively roof top bar and nightclub. Contemporary classic rooms and suites are palatial with all the mod cons. For the luxury traveller. 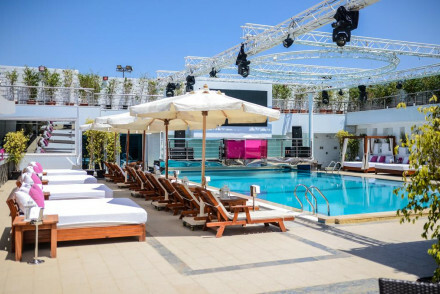 Lively - The hotel has its own nightclub on the roof top. Views - Stunning river views. The best boutique hotel in Cairo. A country house with colonial verandas, a luscious garden, swimming pool, and an excellent traditional restaurant. Characterful rooms have antique furniture, delicate fabrics, and private balconies. Romantic, family friendly, a chic home from home. Sights nearby - Pyramids at Giza, Step Pyramid at Zosser, El Azhar mosque or Khan el Khalili. A grand Five Star hotel with a boutique feel to it. Centrally located with views over the Nile. Gorgeous rooms and suites with tasteful decoration, balconies, and all the mod cons. A choice of Italian, Thai and Lebanese restaurants. State of the art spa, pool and tennis courts. Very luxurious. Foodies - Italian, Thai, Lebanese restaurants. A Five Star hotel in a fantastic riverside location. Luxurious rooms and suites with creamy furnishings, all the mod cons and balconies. A choice of Italian, Chinese or traditional restaurants. Two huge pools, terraces, excellent spa, and unrivalled views. For the luxury traveller. Foodies - Italian, Chinese, traditional restaurants.